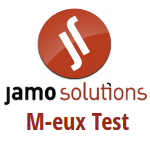 M-eux Test automates functional tests for mobile devices. M-eux Test allows you to create test scripts that are easy to maintain, easy to re-use across different models of mobile phones and easy to re-use for testing new version of the system/service under test (regression testing). M-eux Test recognize and activates the GUI objects on te screen of the mobile device. This allow the tester to create high level scripts that directly represents the end-user actions without the need to take into account the characteristics of the hardware or the theme setting on the mobile device. Utilizing Visual Studio from Microsoft allows you to start automation of the test cases in an early phase. Developers can use the tool to create automated integration and system acceptance test cases. Scripts used for regression testing: cosmetic changes in the GUI interface of the application will not break the script and the script is re-usable across different model of mobile devices. Performance and long duration test cases. GUI Object recognition M-eux Test recognizes automatically the GUI objects on the device like an end-user is recognizing a window, a menu, a list, a button, etc. The script, created with M-eux Test, shows the manipulation of the GUI objects that appear on the screen of the mobile Device. The script is easy to create, i.e. the tool supports recording mode. The statements describe the user actions in a natural readable format making them easy to maintain. QuickTest Professional M-eux Test extends Quick Test Professional from HP , which is the leading testing tool for PC-based applications, towards testing on real mobile devices . This means that the scripting technology of Quick Test Professional are now also applicable and re-usable in the mobile world. Visual Studio & Eclipse M-eux Test extends both Eclipse and Visual Studio from Microsoft. Developers and QA engineers can use their favorite development environment for automation of their mobile test cases. Run-on-Device tool for Field Test Automation The Run-on-Device tool enables field tests by running the test script on the actual stand-alone mobile devices. The test can be executed anywhere and anytime. Platform independent M-eux Test support different Mobile Operation Systems (OS): Android, Windows Mobile and Windows Ce All windows Mobile 6.x versions, Windows CE 5.0 & 6.0, Windows Mobile 5.0 Pocket PC and Windows Mobile 2003 Pocket PC. Following Android versions: Android 1.5, 1.6, 2.0, 2.1, 2.2 and 2.3 Following BlackBerry OS versions are supported: BlacBerry OS 4.6, 4,7 and 5.0 Following iOS versions are supported: iOS 4.2 for iPhone and iPad. Microsoft Foundation Classes for Windows Mobile. Field Tests of services and devices. Re-use the automation script across different models of mobile devices. Re-use the automation script across different versions of the system under test. Create and maintain the automation script in an easy, user-friendly way. Re-use the favorite development environment for creation of functional test cases. Re-use automation expertise and automation investment from the PC world. Gain instant ROI by applying M-eux Test for mobile automation. Permalink Submitted by Siteadmin on July 7, 2012 - 17:35.